You are in this amazing place called Zion for just a short time. What must you do before you head home? Go rock climbing? Try canyoneering? It's so hard to choose. Now you don't have to. Zion Adventure Company has designed just the right day for you; descend a slot canyon, eat something, climb, eat more. What could be better? This full day is great for individuals, small groups, or families who want it all. A half day slot canyon descent will include a hike to the top of the canyon, an introduction to the gear we use, various rappels, down-climbing obstacles and stemming between the narrow canyon walls. After a well deserved snack or lunch, you'll head over to the climbing area. Your guide will then 'show you the ropes.' In addition to doing the actual climbing, you're guide can teach you to belay each other. While prior experience is not required, doing two activities in one day requires some mental and physical stamina. 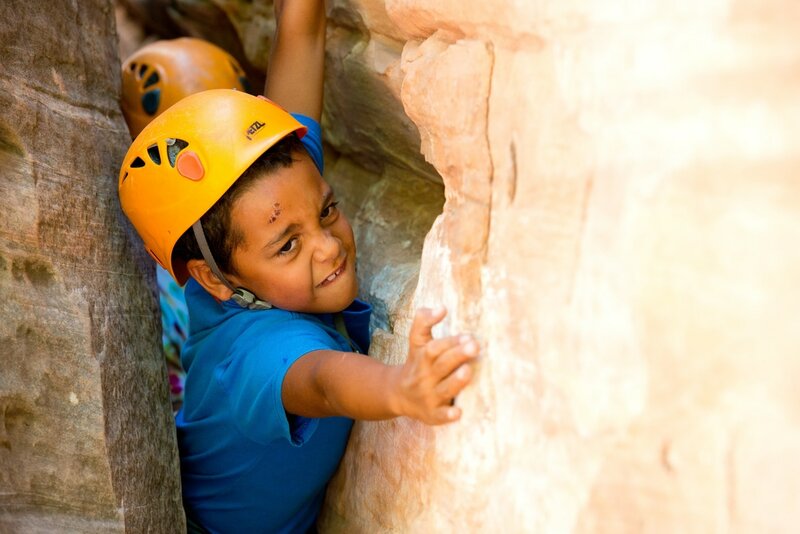 If a bite-sized adventure is more for you, consider scheduling your half day of canyoneering and half day of rock-climbing on separate days. If you are having difficulty choosing, we encourage you to give us a call so that one of our outfitting staff members can assist you. *Professional Photography available through Enlighten Photography. Ask an outfitter for more information. Fun, resourceful, thorough, informative, patient and motivating!! My 7 yr son wanted to become a guide after our day because of the impression the guides made on him." You don't need to have any climbing or canyoneering experience at all to enjoy it- they tell you what you need to know and they help you every step of the way, literally. It's a great family adventure! !